Load your list from multiple computers. How to use the React library to render HTML elements. How to incrementally add features to your application. How to get your application online. 1-ish hours of the basics of clients and servers. 3-ish hours of adding features to you application, broken up into 1 hour chunks. This is just a rough guideline, not a mandate. Some steps you'll go over and some you'll go under. It'll all work out by the end of the day. Probably. Before you can start the tutorial, you'll need to download the tutorial to your computer to edit the source code. Once you've downloaded it, open index.html with your browser. 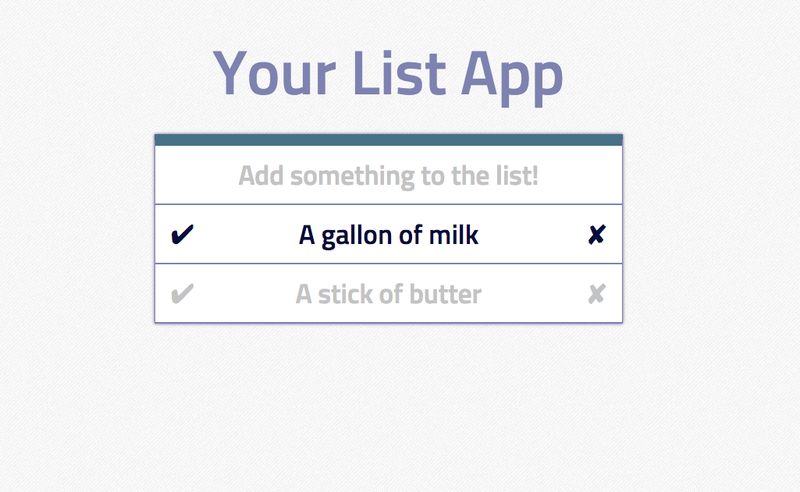 You should see a mock up of your list. If you do not, get an instructor to help you out.